This pretty pattern is similar to Eden in that it features two small birds surrounded by foliage. A castle is visible in the distance. The Reg No 568949 dates the design it to 1910+. Chelsea was manufactured in both bone china and earthenware, the bone china items being translucent when held to the light. Otherwise, the patterns are almost identical - except that the bone china version generally has gilding on the rims. 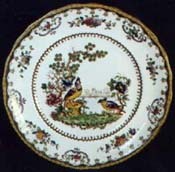 CHELSEA items were made by SPODE for HARRODS, Knightsbridge, London SW1. 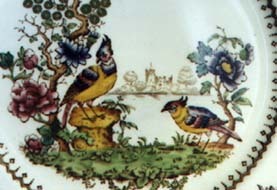 To view Spode Eden items (a similar pattern also featuring two small birds) click here.